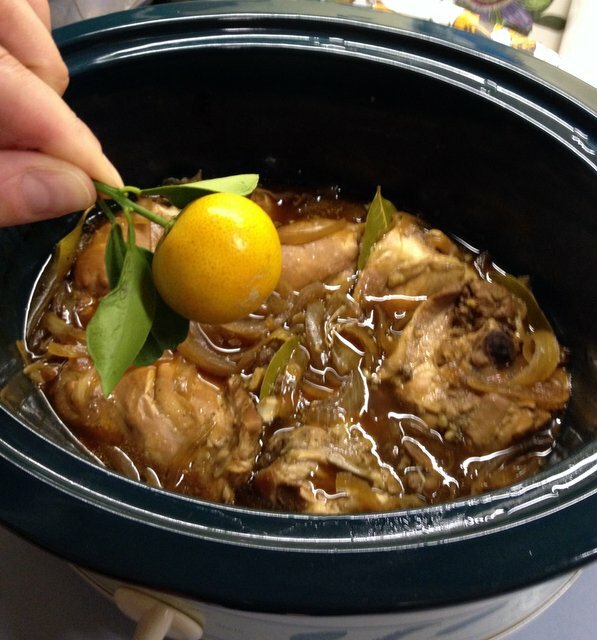 The above linked adobo recipe calls for skinless, bone-in chicken thighs, onions, garlic, ginger, bay leaf, sugar, black pepper, vinegar, and soy sauce. The soy sauce lends the finished dish a deep color, despite the lack of a browning step, and the long, slow cooking coaxes maximum flavor out of the chicken and onions. Thanks to a coworker who hails from Manila, I had a supply of Gentilly-grown calamansi, a small, sour, orange-fleshed, lime-like citrus fruit (see above). On her advice, I substituted calamansi juice for the suggested rice vinegar; she suggested that vinegar was fine for pork adobo, but the calamansi juice was a better match for chicken. She, of course, was right: the bright citrus flavor unified the onions, garlic, and soy. A big bowl of rice soaked up the adobo juices….who needs chicken when you’ve got rice & gravy? Looks and sounds nice! I would surely prefer a slow cooker over Sous Vide cooking. SV just doesn’t do it for me. SV has its place, but it’s so overhyped. It does not magically make everything tasty! And I’m not so keen on the food’s prolonged contact with plastic & heat.